Need another reason to come to South Philly Taproom tomorrow night? 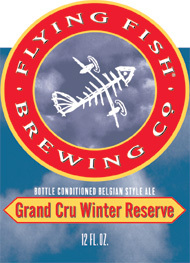 In honor of the occasion, Flying Fish will be tapping the first Grand Cru Winter Reserve Ale firkin of the season. This Belgian-style strong golden ale showcases a variety of the ingredients and brewing methods that help differentiate Flying Fish beers. The Grand Cru is fermented at a higher temperature than our other beers adding an undercurrent of fruitiness and clove (although there is no fruit or spice in the beer). Very lightly filtered, the Grand Cru exhibits complex mouthfeel, strong malt flavors, a spicy hop presence and a soothing alcohol warmth, followed by a clean, dry finish. It is excellent with food as well as served by itself.